(CBS) Before her wedding to Prince William, Kate Middleton was said to have admired the wedding gown worn by film actress Grace Kelly when she married Prince Rainier of Monaco in April of 1956. 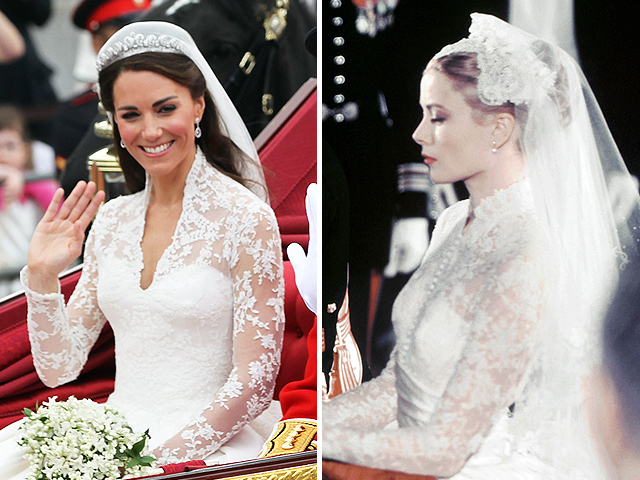 The Sarah Burton-designed lace and satin gown that Middleton herself wore when she married Prince William on Friday, April 29, 2011, had some similarities to that Grace Kelly classic design. Both gowns have the sleeves and shoulders covered with lace that ends in a tight bodice and then flows into a full skirt with long train. Both brides wore embroidered veils. The similarity was not lost on many commentators and onlookers. Several designers have called it a modern twist on the Grace Kelly gown. Tim Gunn, of "Project Runway" fame, also acknowledged the resemblance but said Middleton's low-cut neckline gave it a modern look. What do you think? Tell us in the comments which gown you like better.